What’s the latest on Ryan Shazier? Shazier is making incredible progress after a terrifying spinal injury he suffered in December 2017 against the Bengals. Steelers linebacker Ryan Shazier suffered a spinal injury in December 2017 and has been making slow progress in a quest that stretches far beyond the gridiron. 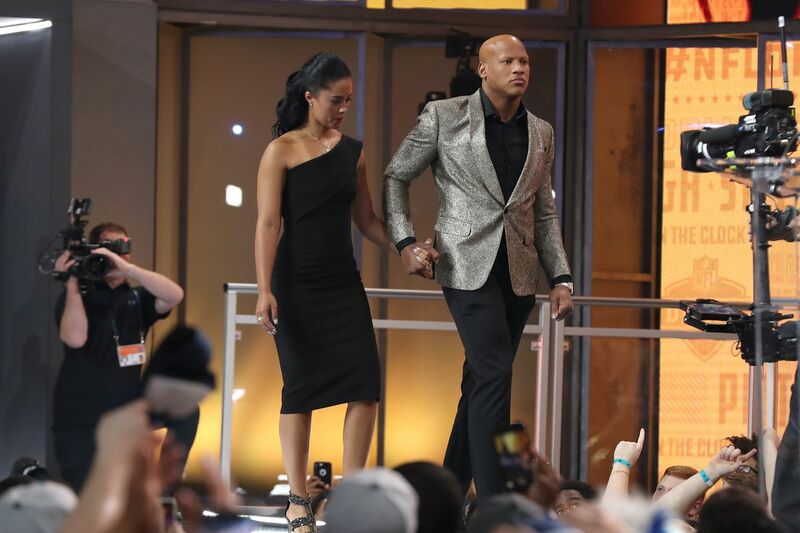 Shazier has made numerous public appearances since his injury; arguably his most powerful came during the 2018 NFL Draft, when he walked onto the stage with some help from his fiancee, Michelle. Shazier did not play in 2018, and though he has said that his goal is to return to the football field, it’s possible he may never be able to play again. Here’s everything that happened since Shazier was injured on Dec. 4, 2017. Following the Steelers’ 2018 season, Art Rooney II gave an update about Shazier’s status with the team. Shazier is set to be a free agent in March. One possibility is that the Steelers sign him to a one-year contract at the league minimum. Days earlier, Steelers linebackers coach Joey Porter told the Pittsburgh Post-Gazette that Shazier had just jogged for the first time since the injury. According to the article, doctors had given Shazier “less than a 20 percent chance” of walking again. The Steelers made their first Monday Night Football appearance since Shazier’s injury in a Week 3 matchup against the Buccaneers. Lisa Salters spoke to Shazier before the game. Shazier spoke at a press conference — his first time speaking to media after his December injury. Shazier said he’s been surprising doctors with his progress throughout the rehab process. His goal for now is to be able to walk by himself without the support of a cane. Shazier attended a Pittsburgh Penguins playoff game and while standing, he led the fans in a “Let’s go Pens” cheer. On Feb. 20, Ryan Shazier spoke for the first time about his injury when he was a guest on his teammate Roosevelt Nix’s podcast. Shazier said that he’s making progress every day and that he plans to play football again one day. ESPN’s Adam Schefter shared on Super Bowl Sunday that Shazier hasn’t just regained feeling in his legs, but he’s also regained movement and is “engaging in a regular walking routine.” But Michele Tafoya reported that Shazier wasn’t walking on his own, which Shazier then confirmed himself. Shazier posted the most encouraging sign of his recovery to that date with a picture that appeared to show him standing — albeit with support from teammate Ben Roethlisberger. Shazier was on hand to cheer on the Steelers during their Divisional Round game against the Jaguars. He spoke to his teammates in the locker room to encourage them, according to CBS’ broadcast. Shazier celebrated the Steelers’ Week 14 win over the Ravens with his teammates from his hospital bed via FaceTime. It was their first game after Shazier’s injury. Before the game, Antonio Brown and several other teammates wore customized cleats in honor of Shazier. Shazier was injured during a Monday Night Football game against the Bengals in Week 13. On Cincinnati’s first possession of the game, Shazier went to the ground clutching his back after tackling Bengals wide receiver Josh Malone. It looked like a normal, everyday kind of tackle until Shazier didn’t get up. Shazier was immobilized on a backboard, carted off the field, and taken to a Cincinnati hospital. Steelers coach Mike Tomlin did not have an update on Shazier’s status after the game. What does Ryan Shazier mean to the Steelers? Shazier has been the Steelers’ biggest defensive playmaker since they took him in the first round of the 2014 draft. He means so much more to the Steelers than that, as was seen in the way his teammates reacted immediately after his injury. They had a hard time holding back tears in the immediate aftermath and for the rest of the game. The Steelers went on to win that game, beating the Bengals 23-20. They won four of their last five, locking up the second seed in the AFC before falling to the Jaguars in the Divisional Round. He wasn’t on the field, but they didn’t do it without Shazier. Shazier started rehab days after undergoing surgery. He’s still very much a part of the Steelers, even if he never takes the field again. Shazier and his family believe that he will play again. “Yes, I do,” Vernon Shazier said. “I Shalieve.” Shazier and his family consistently use that play on Shazier’s last name and the word “believe“ when talking about his injury. The injury was terrifying, and it’s difficult to even think about whether Shazier can or will play football in the future. What matters now is just Shazier’s continued recovery.